they can exercise slowly and ease the tired muscles. Bino, though, needs more. 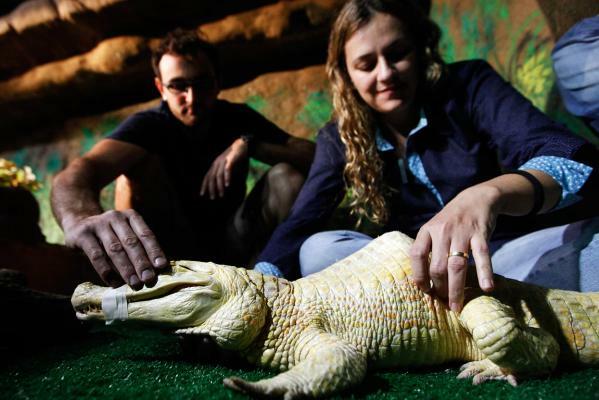 Maybe albino crocodiles are not welcome in the aquarium pool. Bino has been prescribed a weekly 30 minutes acupuncture session. Presumably, crocodiles think that acupuncture works. Actually, Bino may have doubts because the medical assistants have to tape his mouth before the injections. The acupuncturists insisted. They are used to sceptics and also have their own health and safety concerns like the rest of us. Bino has responded well which is a relief because it requires a lot of tape to keep the mouth of Bino closed and awfully strong needles to pierce the tough skin. But none of it has harmed the reputation of acupuncture. Of course, it is not just crocodiles that are prickly. 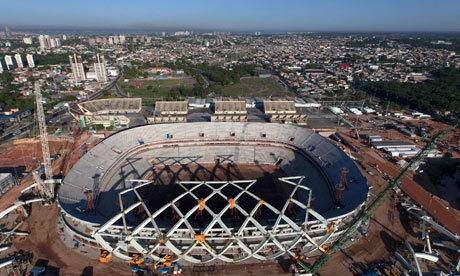 The suggestion that the new football stadium being built in Manaus for the World Cup could be used afterwards as a detention centre has made more than one pause for breath. There is a tradition in South America that involves prisoners and football grounds and it is not pleasant. This is an idea that makes the paranoid look sideways. People with memories think of Pinochet kindly helping people disappear and Margaret Thatcher grinning with South American dictators and urging them not to relent in their fight for cherished economic freedom. required to house 1000. There has already been a prison riot this year, and overcrowding is believed to have been a factor. The number of pre-trial detainees in the Amazon prison system is high. They form 78% of the prison population. Elsewhere in Brazil it is 42%. Of course, Pinochet avoided the detention problem with mass slaughter. Sabino Marques thinks the football stadium could hold prisoners for 72 hours. ‘It’s important to find solutions,’ he said. ‘No one is going to lie down on the grass.’ Such relief, the pitch will not be harmed. And at least they will have plenty of toilets and be able to buy stale pies and sausage rolls. In the days of Pinochet, it was different. At the time, Henry Kissinger said, ‘I do not think we should stand idly by while a country goes Communist simple because of the irresponsibility of its people.’ To the relief of Kissinger, Pinochet organised death squads and killed 400-600 irresponsible people in just 10 days. Once he had taught the Chilean people some individual responsibility, he remembered his own economic freedom that he cherished and set up 125 secret bank accounts so he could syphon money for the security of his family. Back then, people did lie down on the grass but football was nowhere near as important, and people were so irresponsible. And it is not just football fans, old lefties and afflicted crocodiles that are feeling prickly. The Brazilian President Dilma Rouseff has cancelled her October visit to the USA to see Barrack Obama. The NSA have been reading her emails and texts and listening to her telephone calls. Rouseff has a point. There is nothing more irritating in conversation than to have someone finishing your sentences. As Obama knows everything that Rouseff thinks almost when she thinks it, he would have found it impossible to resist. And what can you say to someone who knows everything about you? Surely, the Americans have their own married couples and realise how prolonged intimacy stilts conversation. Don’t they listen to country music in the USA anymore? Like any wronged domestic partner, the Brazilian Government has not been slow to dish out moral scorn. This has been the conversation. The inevitable happens. Couples see others break up and wonder about their own relationships. The Americans could be selling bugged planes to everybody. Thank God people behave impeccably on flights and do not do anything indiscreet. I am okay; a man of my age just reads a book. No, but it did make a mess of the website. Talking of unsightly remains and those irresponsible people that Kissinger understands so well, we have a problem in the favelas. The television programme ‘Fantastico’ has screened incidents of police brutality in Rocinha, which is in Rio de Janeiro and is the largest favela in Brazil. It is all the fault of the Pacification Unit, which has been set up to take away control of the favelas from the drug barons. There are 34 Pacification Units in Brazil. Five officers and a Commander have been indicted on charges of police brutality. Not everyone in Rocinha is against the Pacification Unit. Primary school teacher Joanna Ferreira De Silva agrees that the police are beating people up but thinks they are not targeting the innocent as happened before the Pacification Units were established. Others complain of homes being invaded at all times of the day and they identify innocent relatives who have suffered. Meanwhile, up the social scale, the people in the banks are on strike. Not the normal capital strike from the powerful that cheer on people like Pinochet. This is a labour strike by employees. The strikers have rejected a 6.1% pay rise. They want 11.93%. David Cameron, who has his own views about irresponsible people, should look at his troublesome Union opponents like Bob Crowe and Len McCluskey and think himself lucky. 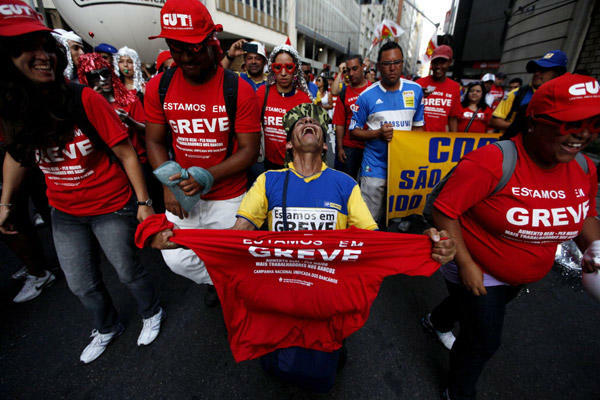 In Brazil, the employees think the banks can afford it. The banks made a profit of R$29 billion. The bank employees are not just demanding a pay rise. They think the banks can reduce high rates of interest and the fees charged to the customers of the banks. They also want improved care for the population. The people, whom Pinochet, Kissinger and Thatcher thought they could defeat, continue to struggle and resist. The irresponsible of South America waited, remembered and change has come. Surprisingly, Kissinger has not made any comments about irresponsibility. For some time, he has been obliged to stand idly by. If you want to read about Brazil and much more click here. Fascinating piece which highlights ongoing issues within Brazil and the usual American hypocrisies. Keep up the good work Howard! Yet another fascinating and informative piece about Brazil. Howard’s obvious skills in relating such events are clearly evident throughout.